2.25 kWp power was installed on the roof of the small house that covers the electrical needs of the 2 houses (lights, fridge and occasionally hair dryer and vacuum cleaner – both low watt appliances), the reed-bed pump system, water pump system, washing machine and electrical tools used on the eco-lodge. 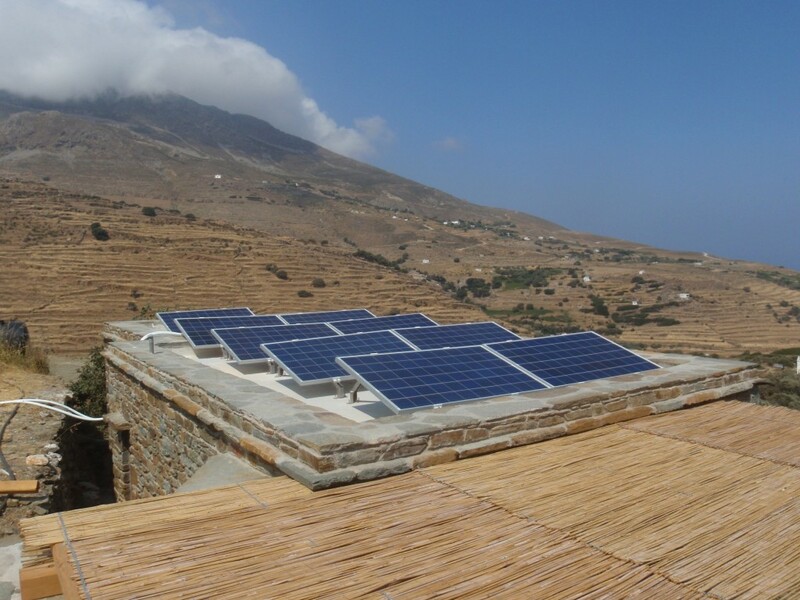 The installation was completed and tested in 4 days by the team of Giannis Sgourakis, Tasos and mr.Thodoris, Giannis’ father. After one year with solar and candle lights we were amazed to realize that light is definitely a matter of getting used to. However, cold drinks from the fridge were greatly appreciated!